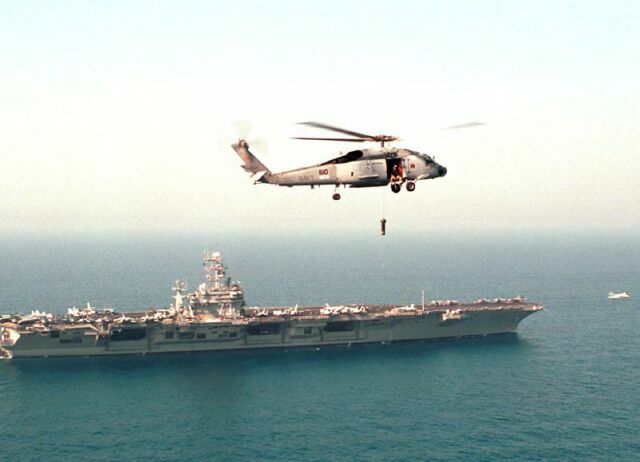 The Arabian Gulf, 25 July 2000  An SH-60 Seahawk from the "Red Lions" of Helicopter Anti-Submarine Squadron One Five (HS-15) dips its sonar while conducting anti-submarine warfare (ASW) training off the starboard side of USS George Washington (CVN 73). An aircraft can also been seen launching from the deck of the carrier. George Washington is operating in the Arabian Gulf in support of Operation Southern Watch. U.S. Navy photo by Photographer's Mate 2nd Class Lisa Marcus.